in the last post we looked at anna sui's wiener werkstatte- inspired fall/ winter 2008 collection with its strong klimt influence. then i sort of accidentally began to realize that she was not the only one! john galliano for dior, in his couture collection shown in paris in late january, the links to klimt are even more unmistakable. some of the galliano gowns can almost be traced to specific klimt paintings. but it does not stop with these two designers. though i couldn't see it (apparently using gold this season is enough for someone to write that your collection was inspired by klimt). in mexico, Jose Eduardo Trevino and Mauricio Ibinarriaga were credited thusly. and in new york, Proenza Schouler, and Erin Fetherston. like i said, i couldn't see it. oscar de la renta's col- lection also was suppos- edly inspired by klimt. i can sorta see it. why, you might wonder, is klimt suddenly so hot? it suddenly struck me last night -- i think it's incontrovertible, despite the fact that i'm the only one i could find who is saying it. 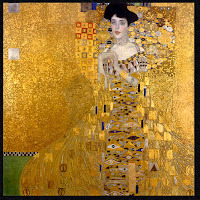 klimt's painting of adele bloch- bauer caused more head- lines in the art world than anything else in 2007 -- and it was a really great story. that and the neue gallery's exhibition of that painting and other klimts was inspiration enough for anyone (even rami from project runway). 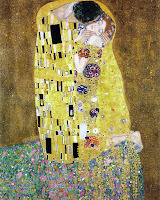 just as the influx of japanese artwork was enough inspiration for klimt some long generations ago. That was bril, as always. But wait! You can already get pix from the Bryant Park episode of Project Runway? Good grief!! yeah! they're all over the internet. and probably a bunch of other places too! The fall Proenza? Definitely not Klimt at all. What on earth...? For the Oscar de la Renta I'd have to review and look very closely...it seemed to be composed of lovely variations of his usual stuff, beautiful prints and what not, but surely more keyed into the "ethnic print" trend than pulling from Klimt...? Anna Sui has always been one of my favourite designers, not because of her "hippy chic" but because she's clearly as in love with 19th century art as I am (if not more). And mixing it with a lot of Native American styles and motifs just brings out crazily good visions. well i had never even heard of proenza before, but yeah. as i said--i think anyone who used metallic gold in their collection had the k-word applied, and they both did, though i thought the one i showed of odlr's was the only one that really seemed klimt-esque. but the gold points straight at adele again, don't you think? i notice also now that reviews of sue stemp's and phillip lim's collections mention the klimt inspiration, and again i see only the gold thread, though lim has some jewelry that might fit the category. It's so spectacular, "coup de coeur" for the galliano's dress ! Beautiful post! These designers definitely are showing some Klimt influences (I love the gold Galliano gown). I'm glad I ran across your blog! thank you butterfly--and thank you for teaching me a new phrase. i posted a few of his pieces from his japonisme collection last year, so i guess he really likes this era too. and i'm glad you did too, margaret--welcome! your blog looks interesting and i'm looking forward to exploring it. I am a bit lost here in the comments, but this post is the first thing I've ever read about high fashion that I could somewhat understand. I mean, I've always enjoyed fashion imagery, but this is the first time I got a clue what was going on. Thank you, Lotus. You're expanding my horizons with beauty. that's really cool a.d.--thanks! and i love the way you put that.